Anthrolume’s LED trenchcoat coming to Electric Sky! Home Projects Anthrolume’s LED trenchcoat coming to Electric Sky! 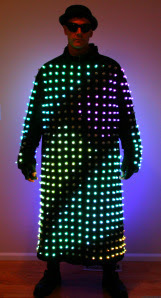 Bryan Ressler’s (see Anthrolume, his project blog) most recent wearable LED creation is his trenchcoat, which has 1000 LEDs on it. He’ll be bringing it to work on some animations, but also to show it off! Be sure to check out this video of Anthrolume 4.0: The Trench, and come armed with your questions. Get your Electric Sky t-shirt!